Guy Thurston Parrish, age 89, of Westminster, died Tuesday, January 8, 2019 at Westminster Healthcare Center, following an extended illness with dementia. Born August 18, 1929 in Mckinstrys Mill, he was the son of the late Raymond A. and Mary L. Repp Parrish. 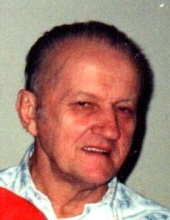 He was the husband of Margaret Parrish, his wife of 64 years. Mr. Parrish attended Elmer Wolfe High School and worked for M.R. Pfoutz, retiring after 34 years. He was a member of the Westminster Moose Lodge. He and his wife enjoyed attending country music shows and dances on the weekends. He also enjoyed going to carnivals, fishing and animals, especially his cats. He loved spending time with his granddaughter, Nicole, his pride and joy. Surviving, in addition to his wife, are daughter and son-in-law, Rosalie and Stewart Keyser of Gettysburg, PA; granddaughter, Nicole Keyser and fiancé Dustin Smith of Bonneauville, PA; brother, Charles R. “Deacon” Parrish and wife Nancy of Taneytown; and numerous nieces and nephews. He was predeceased by sisters, Isabelle Farver and Louise Pomeroy; and brother, Albert Parrish. A funeral service will be held on Saturday, January 12 at 2 p.m. at Hartzler Funeral Home, 6 E. Broadway with Debbie Williams officiating. Interment will follow in Pipe Creek Cemetery. The family will receive friends on Saturday at the funeral home from 12 to 2 p.m.
To send flowers or a remembrance gift to the family of Guy T. Parrish, please visit our Tribute Store. "Email Address" would like to share the life celebration of Guy T. Parrish. Click on the "link" to go to share a favorite memory or leave a condolence message for the family.